Strange AI behaviour in "Get Up Kids!" Status: offline I have some trouble playing "Get Up Kids!" with the Americans. In the set-up segment I took great care to place the American units out of the LOS of the German set-up area, to avoid a classical "first turn slaughter" and to get the first shot as the German moved towards the VP hexes. The German AI made a few very cautious moves towards the American positions (and the VP hexes behind them) in the first turn, losing a Jpz IV and a couple SS squads. It then made no further attempt to move. I had a glimpse of several AFVs moving towards the upper right corner of the map (the VP hexes are at the bottom) on Turn 2, then nothing happened in the next three turns. A lone 251/1 starts and stops its engine without moving out of its hex, but apart from this AFV, no units ever move (neither engine or marching sounds are heard). I am a bit puzzled: there are four American-controlled VP hexes (two of them in buildings, two in road hexes), so I expected to see a horde of Germans rushing to the bottom of the map. The AI, however, just doesn't seem to care about them . I checked the AI attitude and the Germans are correctly set to "ADVANCE" . A saved game at the start of Turn 6 is attached below. AFV to reach the bottom of the map in a few turns. for OBA targeting but it is consistent with the AI's unexplained and uncanny behavior. is placed from the defensive side. That would require a whole new scenario to try to do it justice. Status: offline The problem is that the VP Locations are too far away for the AI to see. Add one or two closer and the AI will work just fine. My suggestion is to place a VP in a crossroad location within the 20 hexes visibility range. I just discovered that the AI does not need a radio on the battlefield to call in OBA. The AI can call in OBA without radios therefore without spotting. Don't know what criteria the AI is using for OBA targeting but it is consistent with the AI's unexplained and uncanny behavior. Correct, AI doesn't need Radio support weapon because it's automatically assigned. It's stated in the manual (section 9.4, second sentence). is not a bad idea and could make for a more challenging game. Yet, that also means there's nowhere to hide! that also apply to exit hexes which are usually far and out of sight of the AI? I am aware of the very limited capabilities of the AI on the attack, so I played (and enjoyed) all of your scenarios taking the attacking side first. Then I tried to play them as the defender, but I did not expect a show of great tactical genius by the AI. The AI "run to the exit hexes" syndrome appears to be in force even when there are VP hexes on the map (e.g. in Beachhead at Ozereyka Bay). When there are no VP hexes (e.g. 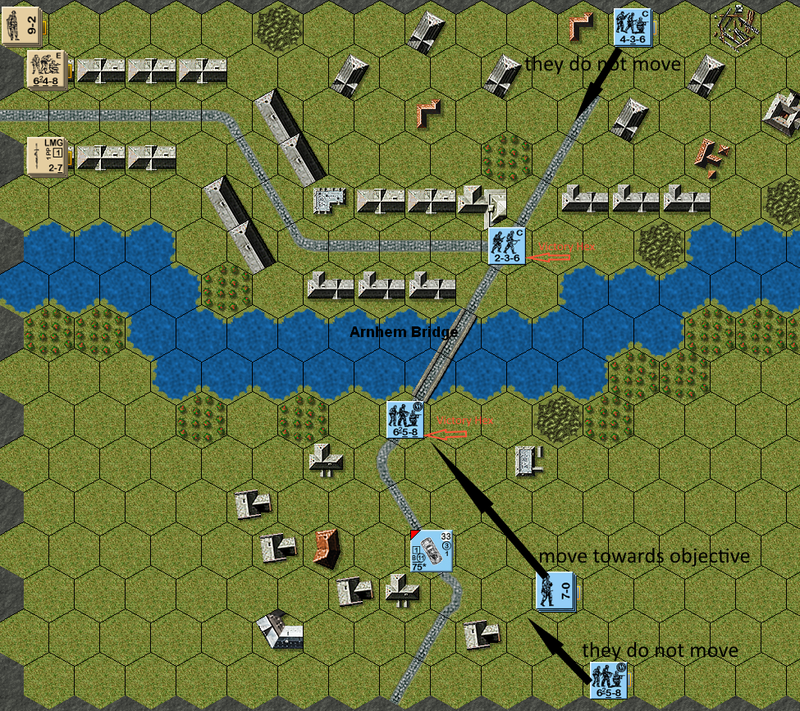 in The Fugitives, Gambit, The Czerniakow Bridgehead or Weissenhof crossroads) running ahead of the AI units (which is quite easy, since they seldom use double time) and waiting for them as they move across open terrain is a sure recipe for a quick victory. AI doesn't need to have a VP/Exit hex in LOS in order to move towards it. AI to a human exit hex determines which AI units will move towards the exit hex to defend or is that dependant on distance? I hope I'm making sense and hope it's not covered in the manual to avoid looking worse than I already do. Status: offline At the beginning of the scenario I have two hex victory occupied by 1 German unit. At a distance of 5/6 hex I have 3 German units to the north and 3 to the south + 1 (the victory hexes are in the los of these units / AI Attitude = Advance) but not all German units go towards the hex victory. Is this normal? I'm developing the Ai of a tactical game (infantry in WW II) and I'd like to learn more about the AI of T.t.H. Well for the Type #3 scenarios you want some units get off a map, that's where you use Exit hex tiles. If exit hexes are human player controlled, AI will want to stop the human player exiting units off the map. If AI owns the exit hexes in a scenario, AI will want to exit units of the map. The exit hexes were designed for Type #3 scenarios in mind. Status: offline Excuse me Peter, but have I missed some step about how to define Exit hex control? As far as I have been able to understand, hexes are defined as controlled by a side if they are VP hexes (and a unit of that side was the last to enter them) or if a unit belonging to that side is in the hex. In my experience, AI units start moving towards the exit hexes on its very first turn, regardless of the location of the human player units. I have been able to somewhat mitigate this behaviour by adding VP hexes and by setting the attitude of some (or all units) to "DEFEND X,Y". The latter method, however, implies an invariable AI setup and greatly limits the replayability of the scenario. Should putting a VP hex (controlled by the defending side) in the Exit hex prevent the AI units from attempting to control it? Last, but not least, it would be nice - for people attempting to design or port scenarios - to have some idea about the way the AI "thinks". Status: online Only use exit hexes if you are working on Delaying Action or Breakthrough type of scenario. Example: Say you want to design a scenario about Stalingrad in December 1942, where some German elements of 6th army are trying to break out of the Russian encirclement. Let's say human player controls the Russian Side and AI controls the Germans side. So you put some German exit hexes on the map and in the Victory Conditions dialog you specify how many points AI SQUAD/SH/AFV/etc AI gets for exiting a specific type of unit off the map. And the Russian side units are trying to prevent the AI exiting units so that the German AI doesn't win the scenario. The Victory Conditions screen lets the scenario designer specify level of Victory for each side - this is where you specific how many points German side must get to really win this breakout scenario. You do not put exit hexes on map for a scenario that is about meeting engagement, you put regular VP exes in the middle of a map (or such) so that you can simulate two forces meeting each other on the battlefield/map. You also don't want to put exit hexes on a static defense scenario as you want the AI to engage your defensive position, simulating AI attack. Rather than trying to focus on exiting the map. Exit hex functionality in TotH works the same way as in say Talonsoft Campaign series. Status: offline I am aware of the purpose of Exit hexes: what I would like to know, given the current AI behaviour, is how I can design a breakthrough scenario in which a defending AI does not run away. I noticed, however, that in every scenario where Exit hexes are present (including some built-in ones, e.g. 012 - 7th Somerset at Oosterhout) any defending AI unit that do not see enemy units moves towards the Exit hexes. It this does mean that the AI can only play the attacking side in a Delaying Action/Breakthrough scenario including Exit hexes, I can live with it. I am aware of the purpose of Exit hexes: what I would like to know, given the current AI behaviour, is how I can design a breakthrough scenario in which a defending AI does not run away. Give an AI unit/AI group Special Command "DEFEND A HEX" with X,Y coordinates. This will guarantee AI unit/group defending a specific VP Objective (VPO) and not worrying about any other VPOs. Do not use VPOs and exit hexes in the same scenario or designate a specific AI group for defending Exit hexes and another AI group defending VPOs, and if you like let another AI group just be on the offensive by giving it Special Command "ATTACK". and make adjustments to AI while I'm trying to port a scenario to TotH. Thanks for the insight. Status: offline Thanks, Peter, I also have several half-completed scenarios that can finally see some progress. Why don't you disable the "Fog-of-war" feature? It should allow you to see the AI movements without affecting them through the presence of extra units, that will be attacked by the AI. Status: offline What scenario were you playing? Whatever the AI setting (HOLD or ADVANCE), if the two VPs are the only ones on the map, the AI units should not move at all. If there are other VP hexes not controlled by the AI, the AI units will attempt to take them. Anyway, try opening the scenario with the Editor: some units might have "ATTACK X,Y" or "DEFEND X,Y" orders superseding the general AI attitude. Status: offline Thanks for the reply. 1) The scenario I did it myself (to understand the behavior of AI). 3) Yes, all the units I set "Attack x, y" but why only some move towards the objective hex?